Dundee manager Paul Hartley believes his team are now ready to shine after two years of hard work. 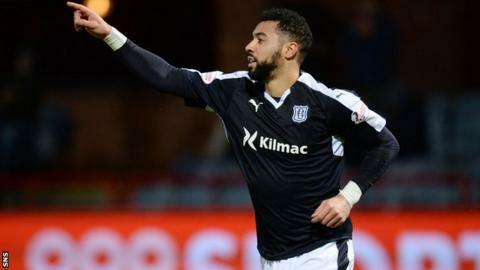 A Kane Hemmings double helped Dundee despatch St Johnstone 2-0 to leapfrog their opponents and move joint-fourth in the Premiership with Ross County. "We're just building this squad, it's taken nearly two years to build it," Hartley told BBC Scotland. "Everything behind the scenes too, the structure of the club, I feel we're getting there now." Hemmings gave Dundee the lead when he pounced on the rebound after St Johnstone goalkeeper Alan Mannus could only parry Greg Stewart's shot. And the on-form striker doubled the lead in the second half when he latched on to Gary Harkins' through ball and finished well for his 18th goal of the season. Stewart also hit the bar and Hartley admitted he felt his side should have won by more. "I thought the players were excellent from start to finish," said Hartley. "We dominated the game, some of our play was excellent, especially in the final third. We felt we should have scored more goals tonight. "The four up front - their movement and combination play was excellent. "We'll keep flying below the radar. We'll just keep trying to get as many points from now until the split." St Johnstone manager Tommy Wright said his team can still make Europe for a fifth year in a row, but says they need to cut out the errors that are costing them. Saints are without a win since 5 December - nine games in a row. "I don't think it's a psychological thing," said Wright. "If you look at the game we had some good play. "We're making too many mistakes and careless mistakes in possession. "We're not making the most of opportunities and I think at times in the last third we're not brave enough; turning down crosses, turning down opportunities when we should shoot. "So, it's just a combination of little things that we can do better. "This team hasn't become a bad team overnight and they can go on a run and we know we can go on a run. But, individually the whole squad has got to do better and take a lot more responsibility in their performances."